Joe Perry continues to just pick up that guitar and create songs and has no intention of stopping, proudly saying "I might as well put them out because I've got more coming!" In the annals of classic to current rock 'n' roll guitarists, there are a few that undeniably stand out as stalwarts. You've got axemen like Keith Richards and Jimmy Page who never seem to have lost the limelight. Jeff Beck and Steve Vai remain perennial favorites. David Gilmour and Pete Townshend are rightly never far from the short list of the best and most consistently producing rock guitarists of all time. And while that list goes on and on (the comments section here is sure to point out a plethora of six-string supermen that I didn't shove into this first paragraph) one name that should never be left out is Joe Perry. The lead guitarist for Aerosmith first hit big in the early '70s and with very few valleys between the peaks, he has never quite vacated the collective consciousness when it comes to the all-time great rock guitarists. 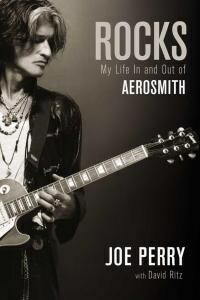 There is, of course, no better man to tell the story of Joe Perry than Joe Perry himself, which he does in his new autobiography Rocks: My Life in and out of Aerosmith (written with David Ritz). PopMatters sat down with Joe Perry to talk about his career, both in and out of the book. "There's a saying that you don't have to sell a painting to be a painter." Joe Perry explains. "You have to just pick up the brush and paint and then you're a painter. If you sit down and you write poems, you're a poet. I kind of feel like that holds true. Because who's to say that you have to sell 100,000 records before you're qualified to be a rock 'n' roller?" A rock 'n' roller, Perry most certainly is and while the Cliff's Notes version of his life might indicate that his rise to fame was instantaneous, the guitarist is absolutely no stranger to paying his dues, both before and after Aerosmith became the iconic band that they are. "I didn't come from a musical family." the guitarist confesses. "I didn't have music as a kind of background, so as far as songwriting and the mechanics of that stuff and learning about music ... I was a slow learner." Perry's self-professed slow learning dogged him during his school years and was largely the result of ADHD, a condition that remained undiagnosed until recently. "It was looked at as a discipline problem when I was in school. And certainly, over the years, after I left school, I had forged my way into this thing called rock 'n' roll and it was less of an issue." However, Perry now considers the possibility that the learning disability was something of a double edged sword for his career: "I'm starting to realize than in some ways it's helped my guitar playing and it's hurt my guitar playing in the way that I kind of learned certain things and my ability to retain certain things." In an effort to curb young Joe's behavioral issues, his parents enrolled him into a preparatory school which failed to understand his condition. "[We wore] corduroy pants and a tie and if you didn't get good grades it meant you had to do study hall more and that was about it," Perry remembers. But in something of a cruel irony, the school has changed considerably in this area. "It's actually turned into one of the foremost prep schools for people with learning disabilities, especially those types of disabilities. So I was only 30 years too late as far as that goes." the guitarist laughs. ADHD remains mysterious to many who don't have it, especially when it comes to the positive side of the condition. Anyone who has ever seen Perry's performances can attest to the fact that he plays guitar right handed. Fans may be surprised to note that Aerosmith's lead guitarist is actually left handed. Starting out self-taught, Perry simply followed the instructions that came with his first guitar and held the neck in his left hand. "There's a certain reason why I picked up the guitar and naturally played it [right] handed, like there was some kind of instinctive thing about the dialogue that you have with the fret board, you know, with your dominant hand. On the other hand it forces you to work, to think of things in a different way, so it may have helped with my style, it may have hindered it, I don't know, but I've made it this far, so ..." he laughs. His adaptability is partially a credit to his ADHD. Could this adaptability go the other way? "When I was in my 30s. I started playing left-handed to try it and see if it would come along a little faster but it was even worse than starting from scratch because everything was so tuned the other way. I gave it a try because I've heard that there was a couple of old Blues guys who were able to do that, you know, switch. Just to try it. I'd been down the path for so long going the other way, it was almost like I had to unlearn stuff to even get to zero. It's a little late in the game now. I don't know if I'm gonna spend time practicing. I'm going to do it and try to advance myself with what I know." For the good that ADHD may have done Perry musically, it didn't help him in school and the young Joe abandoned dreams of being a Marine Biologist ("I still have the dreams about being underwater, believe me!" he confesses) in favor of a different path, that of becoming, as he says, a rock 'n' roller. "I was just hitting my head against the wall in school and thinking about going to school for four more years of the same kind of aggravation and failure ... I didn't see it." Even with this decision made, Perry and Aerosmith's rise to fame was, in his words, "a slow build." There was no single defining moment that Perry woke up and said "I'm gonna be a rock 'n' roller! I'm gonna try to be a big star!" "It was more like 'Well, this is what I'm doing and we're getting somewhere,'" he explains. "You just have that feeling like you want to do it and you're doing it so therefore you are." "I think that when the band got together finally in Boston and the band started to sound really good," he continues, "even at the rudimentary level we were at, there was a sense that we had something and nothing else was gonna get in the way. Personalities, starvation, eviction notices, nothing was gonna stop us from playing together. That was the point where I felt like 'This is what I am. This is what my gig is.'" One early standout moment in Aerosmith's rise relates to vocalist Steven Tyler's certainty of success. The memory still makes the guitarist laugh in his own relaxed, very Joe Perry way. "There was one point when Steven actually asked me for my autograph," he muses. "I can remember that he asked for my autograph because he said 'We're on our way!' I had to laugh, you know what I mean? As far as I was concerned, 'Hey, we slept over in a truck. Tomorrow we still have to drive to blah-blah, we still have to do this.' But it was before we had a manager or had gotten that far. That was one of the things that made the combination. Our version of the team, you know, the songwriting team." And that songwriting team proved to be multi-platinum over the course of each active year with the band. Tyler and Perry were also no strangers to self-destructive behavior and aside from comprising one of the most successful songwriting duos since Lennon and McCartney, the pair also became known as "The Toxic Twins" due to their drug use. This chapter of Perry's life is long behind him, although Tyler once convinced Perry to start snorting painkillers with him after shows (a situation that almost cost Perry his second wife). Occasional acrimony and differences between the singer and guitarist have led to a number of ups and downs. Recent years have shown Tyler's absence from Aerosmith as the vocalist has concentrated on his stint as a judge on American Idol as well as his unsuccessful audition to replace Robert Plant in Led Zeppelin. Perry even considered auditioning new vocalists for Aerosmith in Tyler's absence. Could this signal some sort of breakup of both the team and Aerosmith? Not if Perry has anything to say about it. "You know, we still get along with a lot of ups and downs and we're like brothers, you know?" he explains. "If there's anything that really needs to be dealt with we go in a room and talk about it ... if there's a dressing room full of people, I'll even drag him into the bathroom or throw everybody out and we have a heart to heart. If it's anything less than that, we deal with it the way we have to. And those things still come up, I mean I could add another two chapters to the book just from the last six months." This is, of course, a good sign of the team's current relationship. The past is a different story. In 1979, acrimony between the members of Aerosmith caused Perry to leave the band and embark on his own, not for a month or two but for five full years (as Aerosmith fledged on with replacements for both Perry and rhythm guitarist Brad Whitford). Although he was a superstar with Aerosmith (having headlined over such opening acts as Van Halen, Ted Nugent, AC/DC and Foreigner), his early days with the aptly named Joe Perry Project were not at all easy. At one point in 1980 Perry's debt was so severe that he was forced to sell his prized tobacco burst 1959 Gibson Les Paul. Perry believed the guitar to be lost to him forever, but the instrument changed hands a few times over the next 12 years or so (at one point belonging to virtuoso Eric Johnson) before Perry opened up a copy of Guitar Player and recognized his former property. The Les Paul was featured as a part of the collection of a fellow guitarist and friend of his named Slash, then the lead guitarist of Guns N' Roses. Over the next eight years, Perry repeatedly asked to buy the guitar back from Slash, but was denied the chance, as Slash knew the value of the instrument. "It got to the point that it was interfering with our friendship because I could tell ... I know he wanted to give it back to me but he couldn't part with it." Interference or not, the friendship between the legendary Perry and the younger guitarist who took up the instrument because of Perry's playing (after listening to Aerosmith's 1976 album Rocks) was strong enough to survive. "I understood what was going on there and at least I knew where it was. And I know that if I had said 'Slash can I borrow the guitar for blah-blah?' he would have given it to me for that." This proved not to be necessary, as on Perry's 50th birthday he was presented with that same Les Paul as a gift from Slash. "I think it was just a matter of him reconciling 'Maybe I should give it back to him,'" Perry explains. In his mind, the axe is still "The Joe Perry/Slash Les Paul". "He knows that if he ever needs it or wants it to play, it's his to use and we both know where it is," the guitarist magnanimously says. So the lost guitar story had a happy ending. But as that story began, both The Joe Perry Project and Aerosmith were dragging through rough spots. Aerosmith's albums without Perry proved to be relative critical and commercial failures and while The Joe Perry Project was a successful experiment, it didn't quite top Aerosmith's highlights (even after Whitford joined the band). This era did, however, force Perry to face his own songwriting demons and start to write both music and lyrics for himself. "I wrote songs for Aerosmith with Steven and that was basically it. Doing the solo record was (like I said in the book) almost like a solution to a different kind of problem." Once the musical partnership had come to an end, Perry found himself with only half of the ingredients he had become accustomed to. "I think that part of it was the frustration of writing all these songs all with just music and having it just lie there," Perry remembers. Not wanting to leave these once wordless songs unfinished, Perry began to push himself to write lyrics, thinking "What's gonna happen when I run my motorcycle into a tree? All you're gonna have is a bunch of riffs that are potential songs, so I might as well finish them off. I might as well write the lyrics for them so at least you have some songs there to put out for my posthumous solo record." This was what Perry calls his "dark joke" that caused him to find his own voice as a solo songwriter before the (thankfully fictional) motorcycle accident. Dark joke or not, Perry never looked back. "I love writing music. I've always loved recording. I've always loved the process of it, listening back to the songs and again, you know, I've come out of the box as a song writer. It's something I've slowly learned over the years and then it was like a tidal wave. It just kept coming. After it broke I'm down in the studio all the time writing this and writing that. Doing solo music is part of my paradigm now." Clearly Perry was successful in his songwriting endeavor because the first single Aerosmith released after he rejoined the band was Perry's own "Let the Music do the Talking" (originally recorded for the Joe Perry Project's debut album of the same name). Although the 1985 album Done with Mirrors was intended to be Aerosmith's comeback, "Let the Music do the Talking" didn't quite propel the band back into superstardom. Instead a much older song written by Perry with Tyler did that job for them. In 1986 rappers Run-D.M.C. were urged by producer Rick Rubin to freestyle over existing rock albums and soon urged the young hip hoppers to cover Aerosmith's "Walk This Way". "Rick Rubin had said in an interview that 'Walk This Way' was proto-rap and I found that intriguing because we were just starting to get hip to rap ourselves," Perry recalls. "To me it was just like the next step from the Blues. It was street corner Blues to me. You know? Same thing. Instead of an acoustic guitar and a guy standing on the corner singing about what happened to him last night or what's going on in the neighborhood, it's guys with a boom box with a beat and coming up with these incredible stories. Once you're listening to it, you can't stop listening to it"
However, Rubin wasn't content with simply having Run-D.M.C. put their new rap style over the proto-rap track. He wanted the younger group to collaborate with Aerosmith. Perry and Tyler had no idea what this union of rap and rock would become, what it would mean for the music industry and what it would mean for the careers of both Run-D.M.C. and Aerosmith. Instead, the Toxic Twins accepted the offer for the sheer rush of it. "We kind of always had this attitude like 'Well, we'll try anything.'" says Perry, "especially Steven and I who were kind of adrenaline junkies anyway." For all their hard work over the years, Tyler and Perry had always "had a feeling like this whole thing was like a big adventure." Rock 'n' roll is no career that you can be trained for, like your standard cubicle farm job. Perry's answer to Rubin's call was, as he recalls, "Yeah, why not?" reasoning "We'll get a chance to work with Rick Rubin and these cats that are making this new kind of music." Run-D.M.C., however, weren't as wild about the idea as Rubin, or even as experimental as Tyler and Perry. "When we went down there, they were pretty tentative about it. They thought 'Hey, we're carving a new niche, new music here.'" "They were really on to something, so to pollute it with those old fashioned electric guitars, I don't think they were too keen about it. But Rick [Rubin] saw something that none of us [did]. I mean, he was the one that put us together. He said 'Look, I don't even know if this is gonna go on the record. I want you guys at least trying it. Let's see what we can do.' That was kind of the vibe going in and after a couple of hours we got to be friends." Perry recalls the recording as little more than a case of "making some new friends and having some fun playing and revisiting the song." Aerosmith on the whole continued their tour for a few weeks until Rubin called back, saying (in Perry's words) "Hey, come on back to New Jersey, we're gonna cut a video. It's going on the record!" Perry's response to this call was similar to that of the first: "Oh, great, okay, well let's go!" "The video became such a powerful interpretation of the song and the interaction between the two different kinds of music ... we had no idea that it was gonna be what it was gonna be. I'm really proud of that, to be part of that. We really didn't realize what it was doing for our career until we went to Europe and there it was a hit. Some people thought it was our first record. I mean it reached that far. And so we really didn't realize how big it was and how much impact it had until we went to Europe and started doing interviews and started talking to the fans and that kind of thing. "Then we came back to the States and it gave 'Walk This Way' a second life and certainly helped our career. But as far as we were concerned, we were cruisin' along, doin' what we were doin'. We were touring and selling tickets and our fans were there and we were on the path to trying to make better records and this little side project was, like I said, just another piece of uncharted territory we thought we would take a look at, but we didn't have any idea it was gonna be what it is or what place it takes in history, in musical history." "Walk This Way" proved to be an enormous hit that propelled Run-D.M.C. into the mainstream and relit the limelight over Aerosmith. The following year's Permanent Vacation was a multi-platinum mega-hit that did much more than ride the coat-tales of the revised "Walk This Way" but also produced a string of MTV hit videos and an amazing (and financially successful) supporting tour. This success pressed on with 1989's Pump, which cemented the end of Aerosmith's "vacation" and the dawn of a more "permanent" stay in the mainstream of rock 'n' roll. Is this all because Perry answered Rubin's call with "Yeah, why not?" Probably not. The band's success was the result of great songs and great performances. However, this attitude of trying anything has usually resulted in great success for the guitarist and his band. A similar vibe greeted their invitation to perform in the (oft reviled) 1978 film Sgt. Pepper's Lonely Hearts Club Band, which similarly garnered Aerosmith with new fans. "When we did that movie, that Sgt. Pepper movie, half of that was just for the adventure of it and we didn't really think that much about it, you know, 'Oh, this is going to screw up our reputation' or whatever. It was just a chance to go out and try doing a movie, you know? And the upside was that we got to work with George Martin and do that Beatles song ['Come Together'] which was great." Perry's "try anything" attitude still applies to music and while he has left his hard partying and drug abusing days behind him, he refuses to slow down with the guitar. His 1959 Les Paul is far from his only long-time love. Perry is a family man who has been married and faithful to the same woman, Billie Montgomery, since 1985. He remains good friends with Slash as well as with members of the band KISS (he is the only non-KISS member to jam with the band onstage ... wearing a pair of their platform boots) and continues to write music for both Aerosmith and The Joe Perry Project. "Sometimes I write stuff and I'll play it for the other guys and go 'Well, what do you think? Is this for Aerosmith?' Mainly for Steven. 'Does it ring your bell?' And if it's something that he doesn't think will work for him to get behind then I'll rework it. But since then I've started writing stuff that I know is not gonna be Aerosmith and it's gonna end up on the solo record." As for the future of the now skilled and seasoned songwriter, he now admits to having come into his own and found his voice. That writing voice, of course, comes to life in the pages of Rocks: My Life in and out of Aerosmith but Joe Perry continues to just pick up that guitar and create songs and has no intention of stopping, proudly saying "I might as well put them out because I've got more coming!"